For just $1000 you can attend the COMPLETE 4 day, highly intensive, certification program with Therasage EMC. Our students are making $50 - $60 per hour with their clients-- who are thrilled with the results! What Sets Therasage EMC Apart From OTHER Equine Massage Certifications? Therasage EMC Founder and Lead Instructor, Greg Gage L.M.T & E.S.M.T, has been a Certified Human Massage Therapist for over 25 years. He has trained students in Equine Massage for more than 17 years. Gage is a professional member of the Equine Kinesio Taping (KTE1 & KTE2). Therasage EMC uses the latest techniques and modalities, always staying current with trends and best practices. Gage and Therasage EMC are often personally sought after by leading trainers such as John and Josh Lyons, Dan James, Tom and Mandy McCutcheon and equine professionals throughout the US and internationally, as a result of successful outcomes. With Therasage EMC, Gage specializes in trigger point therapy, deep tissue massage, along with stretching and injury prevention for all levels. Note: In addition to these important techniques, The Therasage Certification Program helps students through practical education of enhanced science, business skills, marketing, and career development, and potential employment. For Only $1000 Therasage EMC Can Start You On A NEW, Lifelong, Highly Profitable Career! Think of how much it would cost you at college to earn a degree that could afford you a career that averaged $60-$90 per hour— working for yourself! Our highly educational intensive four-day program features one-on-one instruction that puts students in touch with numerous horses to ensure a broad equine experience. Cost is only $1000 per student— and when you have earned your certification, you will be a highly-trained professional Equine Massage Therapist! The course includes all printed materials (no additional charge!) such as Therasage EMC Manual, charts and diagrams, handouts and worksheets. 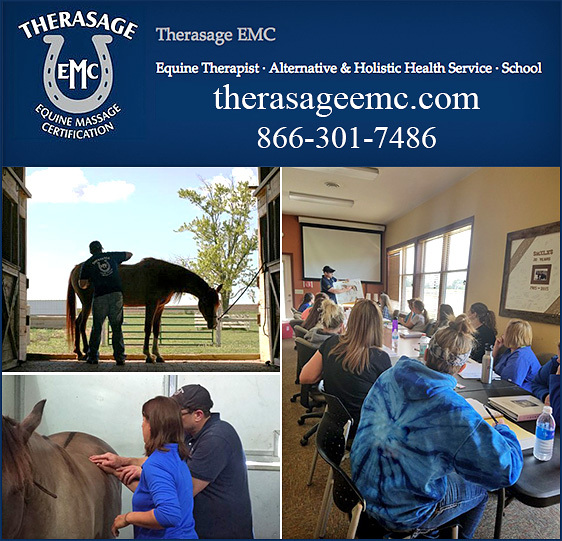 Note: Therasage EMC, believes this certification program will not only benefit students and help them achieve academic and career success but can help further strengthen your care of horses. Can I Really Be Trained in Just 4 Days? How? The Therasage Equine Massage Certification Program compresses a semester and a half of class into four days of intensive training. Because student’s are working in small groups and directly on horses, instruction is often personal and more concentrated, allowing thorough, full-day training. Upon graduation of the program students master full body massage, pre- and post-event massage, discipline-specific massage, tendon, ligament work, while gaining skills to on how to market themselves as an independent small business. Is It True That Leading Educational Institutions Recognize and Support Therasage EMC? What If I Am Already A Trainer, Breeder, Instructor, Or Professional In The Horse World? No matter what equine career you are currently involved in, you are going to deal with horses from time to time that are experiencing pain and discomfort. Your skills as a certified Therasage EMC Therapist will greatly increase your value to your clients— and your own ability to have a profitable relationship with these clients. Even if the horses you help are your own horses— think of the money you will save and the benefit you will enjoy being able to help and care for the needs of your own horses! Don't wait, call today and start your bright new equine career! Note: Therasage EMC Program benefits trainers, breeders, or anyone with a love for horses. Learning the Therasage EMC program can help your horses prevent injury, speed up recovery time, and help your horse achieve top-level performance, whether in competition or casual riding. This program can benefit horses at any level or discipline, and can often result in improved relationships between trainer/breeder/owner and their horses. What If I Am Just Starting To Learn About Horses? Therasage EMC offers a unique learning opportunity through their Equine Massage Certification Program. Therasage's program is the perfect partnership for anyone with a love for horses and their sport, and for those wishing to learn more about complementary and alternative care for horses. Therasage provides a highly educational opportunity for class participants to broaden their knowledge of equine anatomy, develop business skills that lead to a promising career path, and earn certification to be able to gain employment in horse massage immediately upon graduation and for the long-term. Will Therasage EMC Help Me Learn How To Market My New Business? Students will be provided a roadmap to learning how to market their new certification for gainful employment, and, or, a personal business. They will be provided a thorough education and understanding of equine anatomy, physiology, cause and effect, treatment of circulatory and muscular issues. If you want to work, we will give you the tools you need to know what to do to get the work! In 4 Short Days Amazing Career With A $60 per Hour Potential Awaits You With Therasage EMC. Call Today!! Where else could you gain a complete career, and enjoy the rewards of helping horses and their owners, all with a potential of $60 per hour— for a mere $1000 investment? Therasage EMC has numerous host barns all over the country and has been approved since 2001as a post-secondary school for certifications in the state of WI, adhering to guidelines approved yearly by the Wisconsin Education Approval Board. Therasage EMC currently teaches in AZ, MN, NC, OH, TN, TX, WI. Don’t hesitate— call today and get working after 4 short days!